Time for the monthly review again! Each month I share how I did during the past month and what I plan for the next. This is helping me to stay on track, keep focus and hopefully be more productive. You can follow along with me and do the same way to your own monthly to do’s and goals if you feel like it. If so I have a new Facebook group (which I plan to ramp up this month) where we can share our goals and how it goes. Last month I wasn’t too happy about my achievements as you can read about here. But I’m happy to say that October went a lot better and besides always being preeetty self critical I’m proud of myself and the stuff I managed to do. 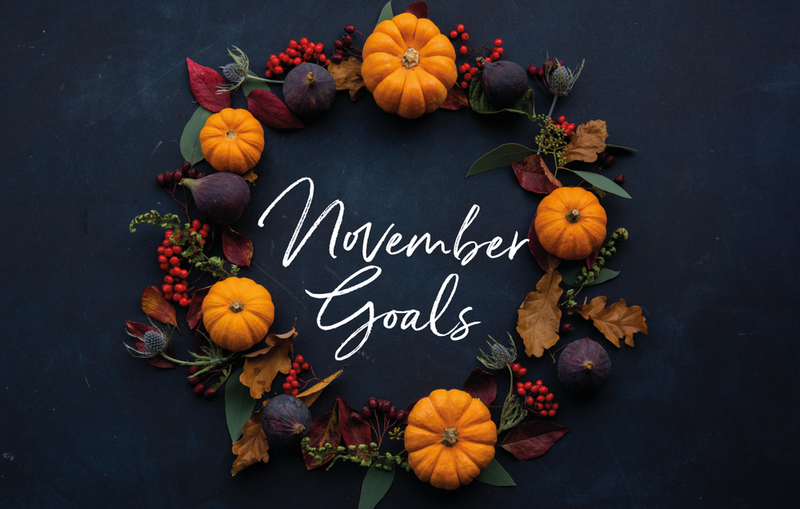 So here’s a review on what happened during October and how I did with my goals. In beginning of October I had plans to attend the Heimtex trade show in January-19 and therefore a new collection was needed, both for practicing and developing my design skills some more, but also to bring some new stuff to show. As it turns out I decided not to exhibit, but wait one more year (for specific reasons that I will share another time). But I still needed a new collection and I’m happy to say that I’m almost finished. I still have one more design I want to create and then work a bit more on the color palette for the whole collection. So - almost done on this one! 2. Start to update my portfolio. Yep, did start and well on my way. Check! 3. Finish up my website project. - Done, bam! This is actually an exciting project - my own pattern bank that I created for my clients and prospect clients. I’ll share more about this in a separate post though. It’s not officially launched yet, still in testing mode, but soon I’ll invite my clients to try it out. 4. Finalize logo for a client - Done! 5. Create a workshop on making a 3-year plan for my email list and Facebook group. Nope, sorry, didn’t have the time to do that. I’ll have to postpone this because of more client work coming in. 6. Batch write 4 blog posts and create 2 newsletter. Nope, this was also pushed down. 7. 50 new images (for using in blogposts, pins & IG-posts etc). Only created about 15-20, so not completed as planned. I feel ok with this though. 8. Attend Design Market and do really well. Well, I did better than last year so I consider this goal reached. 9. 1 date with Johan. Yay! We managed to squeeze this in! We went into Stockholm city, had lunch at a restaurant and went to the Nordic Museum. Check! 10. 1 family activity during fall break. We had intentions and plans, but they fell through because of children wanting to do other things… So not our fault we failed on this goal (ha!) We did go to a Halloween party though, so this counts. Two dead guys and one Egyptian princess. 11. Go on a hiking trip to Vemdalen with friends. Yes, did that and it was awesome. 1. Continue with my Monday morning pin-scheduling routine. Did 3 out of 4 at least. 2. Admin Fridays. Did about 2 out of 4. 3. No working on Sundays. Did really ok on this one, can’t remember working, only drawing. 5. Set up weekly to do lists. I did make to-do list, but not that structured as I had intended. 2. Move my body. Can you hear my joints crack? 3. Check emails and social media 3 times a day, max. Almost managed to keep that. Some days I didn’t. 4. Document my time. No, forgot. I also made a reminder note on my pinboard. So how did that work out? I actually forgot to look at it. A reminder on my sceen to tell me to look at my reminder perhaps will improve this? 1. Finish the new pattern collection. 2. Finish the portfolio update & send to 3 companies. 3. Contact 3 companies & send invitation to the pattern bank. 4. Serve a client well, with a new bespoke pattern design. 5. Start producing a new Skillshare course. Yes, it’s true! 6. Attend a business exhibition and listen to 3 lectures. 7. Plan ahead 1 month of content for Instagram. 8. Batch write 4 blogposts and send out 2 newsletters (yep, haven’t given up on this one). 9. Make a time management tool and document my time and tasks. 10. Start my (vegetarian) diet again + loose 3 kg. 11. 1 date with Johan. Perhaps another museum. 12. Visit the William Morris exhibition at Millesgården. 1. Publish at least 1 blogpost every week. 2. Continue and ramp up my Monday morning Pin-scheduling. 3. Continue my admin Fridays where I do bookkeeping, review the past week and plan for the next. 4. Continue my work free Sundays. 1. Brush my teeth before 9 am. 2. Take a walk for at least 10 minutes. 3. Continue my 3 times a day limit for checking messages and social media. 4. Document my time and productivity. So that’s it. Want to share your goals for support and accountability you can do this in the new Facebook group “Goalsetting with Bear Bell”. Join us here >>.